Lon Francis Simpson, 74, of Granbury, Texas passed away on Thursday, March 1, 2018 at his home in Granbury, Texas. Services for Mr. Simpson will be held at a later day in Granbury, Texas with interment to be at the DFW National Cemetery, 2000 Mountain Creek Parkway, Dallas, Texas. Lon was born March 20, 1943 in Doniphan, Kansas to May Ellen and Oscar Simpson. He married Judith Gwinn on May 3, 1969 in Scottsdale, Arizona. Lon enlisted in the Marine Corps and served during the Vietnam War retiring as a Gunnery Sargent. 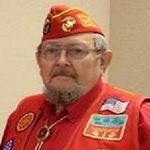 He was a life member of the Marine Corps League, Comanche Peak Detachment 1297 and a member of the American Legion Post 491. Lon was preceded in death by his parents and is survived by his son Michael Lon Simpson and daughter-in-law Jodi Simpson, three granddaughters Brianne, Makenzie and Sadie of Spokane, Washington. Be the first to share a memory of Lon.